There are walks, there are sprints, there are marathons. There are also crippling, tortuous slogs. 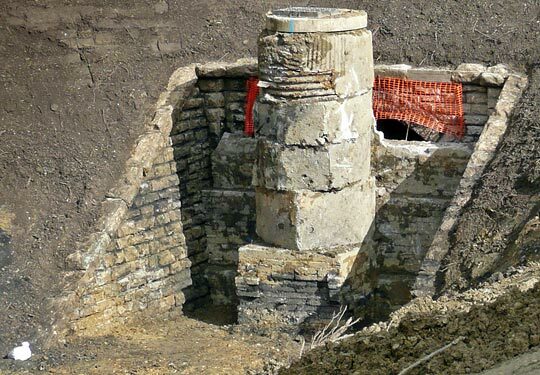 The journey upon which Bath’s ‘Two Tunnels Group’ embarked in 2006 - to convert part of the Somerset & Dorset’s disused trackbed into a path for walkers and cyclists - features amongst the latter; it’s been a sapping test of their resolve. Perhaps it could be likened to a steeplechase through a minefield - bureaucrats ambushing them every few yards with increasingly high hurdles to scale. The path would probably have been open by now had a fair wind been behind them; as it is, physical work only got underway in March. But they are where they are. Palpable is the relief that the fog has now lifted sufficiently to reveal the tricky final push to the summit. The infilled cutting looking towards Devonshire Tunnel's buried northern portal. 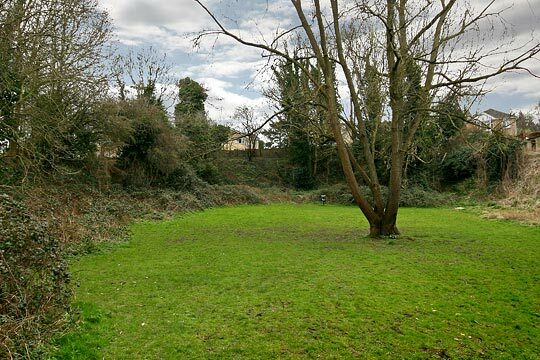 Since the S&D’s life ended in March 1966, sections of its trackbed have been claimed as public amenities. The southern approach into Midford, two miles south of Bath, is occupied by the Colliers Way; further north is the oasis of Lyncombe Vale; then a ‘linear park’ takes over the alignment. Joining these corridors together to form a seamless traffic-free route into the city is the vision. Trouble is, the no-man’s land between them encompasses a couple of missing bridges, a slightly suspect viaduct and the two tunnels that lent the project its name. At a little over a mile, one of these - Combe Down - is the country’s longest without intermediate ventilation. The other is Devonshire Tunnel, much shorter at 447 yards but burdened by the burial of its north portal. 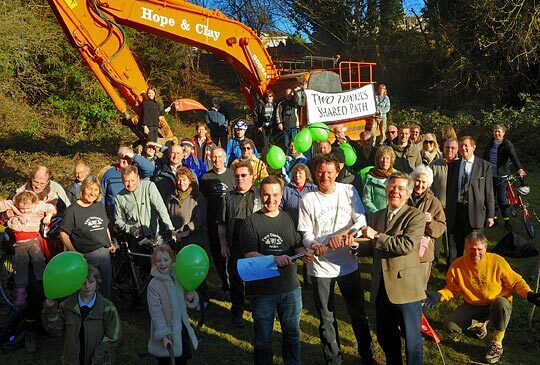 After four years of hard campaigning, a gathering above the buried portal marked the start of construction work. Born in the mind of Mark Annand and nurtured with fellow cyclist Frank Tompson, the Two Tunnels idea sprouted legs with the advent of a website, supporters group of 500+ members and high-level engagement from the local council and Sustrans. A million pounds of lottery cash was secured through the latter’s Connect2 scheme - an investment of around £150 million in foot and cycle routes - with the former adding £400,000 to the pot. Remarkably, the auction of a hundred pig sculptures netted another £200K! They were flying, but soon plummeted back to earth as the wing-clipping blight of red tape and risk aversion forced progress into freefall. But four years and 27 meetings of the steering group later, all the eyes had been wiped and the teas drunk. No stone was left unturned, unsurveyed, undebated, uncosted and unaccredited. Nothing was left to do but build it. 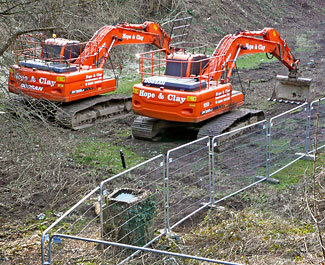 So, in the nick of time, the first excavator rumbled onto site. 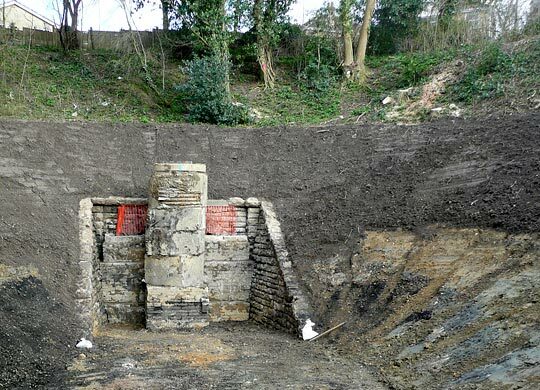 Top of the to-do list was the exhumation of Devonshire Tunnel’s northern portal - an element paid for by a £40,000 grant from the Railway Heritage Trust…as long as it was done and dusted by 1st April. There was no time to fool around. 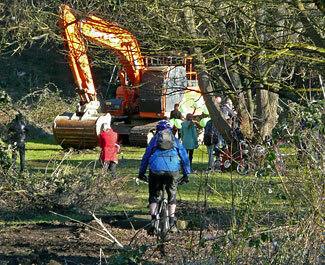 ...whilst the public continues to use the S&D's former trackbed on the approach to the buried portal. Contractor Hope & Clay - almost the most appropriate name ever - established a site presence on 8th March, welcoming a group of supporters and dignitaries for photographs and ceremonial sod-cutting. People and vegetation were then cleared away, allowing the business of unearthing the portal to begin. Devonshire Tunnel is physically fit, having benefited from the state health care programme provided by its guardian, British Railways Board (Residuary). Masonry-lined throughout with a segmental profile, it comprises 21 sections with a functioning drain buried adjacent to the Up sidewall. This has ensured that its interior remains dry except for three small areas where water penetrates the crown. Platelayers were served by 23 refuges. The structure was infamously tight, falling on a 1:50 gradient to its northern end. This was buried in 1973 with spoil from a nearby embankment. 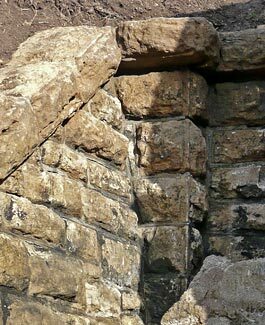 A block wall erected in front of it has afforded some protection, holding the backfill off the stonework. 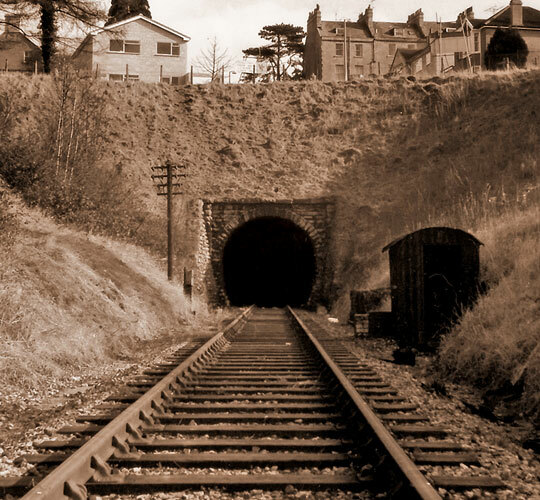 Shortly after closure and before the infill engulfed it, the north portal of Devonshire Tunnel was captured by a local photographer. Revealing the portal - seven metres below ground - took three weeks although the wall will remain in situ over the summer as a security measure. The focus of attention now turns to its innards, removing the debris brought by unauthorised incursion, blasting away the crusted soot that still masks its true colours and then preparing Devonshire for life as a public servant. This involves installing a surface suitable for cycles, lighting and security systems. Working north to south, the project will gather pace, opening sections of the route between access points when each has been completed. Devonshire might welcome its first traffic later this year. Commuters, tourists and the simply curious can look forward to the full route coming on line towards the end of 2011, assuming the team is spared further unhelpful interventions. 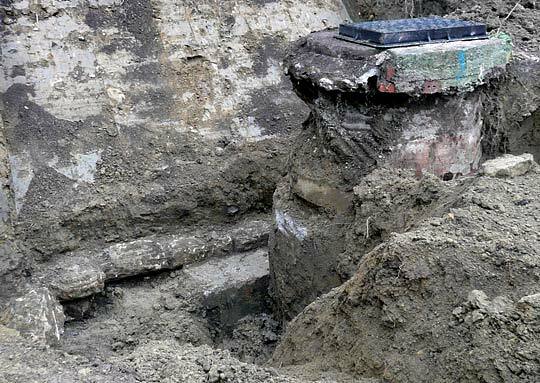 An initial orientation dig revealed the portal - albeit only a small bit of it - for the first time in around 40 years. It says much about 21st century Britain that a scheme enjoying overwhelming, enthusiastic support can be hamstrung by officialdom - busting budgets and tearing up schedules. Who would have blamed the Two Tunnels’ principals if they had walked away to reclaim their lives? Thankfully they didn’t and we should all soon have the opportunity to marvel at the resolve of those who engineered the S&D through Devonshire Tunnel 136 years ago and their footstep followers who later drove a path through it. Despite spending 40 years below ground, the condition of the stonework appears to be pretty good. 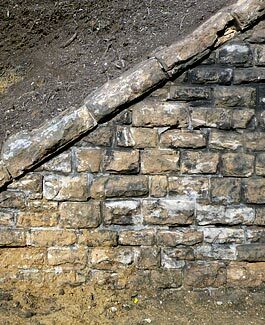 It has also retained that characteristic colour of Bath stone. The ugly block wall and access shaft will be removed after the bat hibernation season is over. Landscaping will soon improve the appearance of the excavated cutting. All the background to the project. Archive shots of the tunnel just before and after closure.